Wednesday's trading session was bearish, as the main U.S. stock market indexes reversed their intraday uptrend and closed lower. Stocks bounced off the support level following Monday's sell-off, but they failed to continue higher. Will the market continue lower today? There are still two possible medium-term scenarios. The U.S. stock market indexes lost between 0.7% and 1.5% on Wednesday, as the investors' sentiment worsened again. The S&P 500 index remains close to 2,700 mark and it currently trades 6.0% below the January's 26th record high of 2,872.87. The Dow Jones Industrial Average lost 0.7% and the technology Nasdaq Composite lost 1.5%, as it was relatively weaker than the broad stock market on Wednesday. The nearest important level of resistance of the S&P 500 index remains at around 2,740-2,750, marked by the previous support level along with Monday's daily gap down of 2,742.94-2,752.68. The next resistance level is at 2,780-2,800, On the other hand, the support level is at around 2,695-2,700, marked by Monday's daily low. The support level is also at 2,675-2,680, marked by the late May local low. Expectations before the opening of today's trading session are slightly positive, because the index futures contracts trade 0.3% higher vs. their yesterday's closing prices. The European stock market indexes have lost 0.1-0.5% so far. Investors will wait for some economic data announcements: Final GDP number, Initial Claims at 8:30 a.m. The broad stock market will probably extend its short-term fluctuations along the support level today. We may see more short-term uncertainty. Is this some bottoming pattern before an upward reversal or just a relatively flat correction before another leg lower? For now, it looks like a correction within a short-term downtrend. There have been no confirmed positive signals so far. Apple, Amazon - Trending Lower? The S&P 500 index fell the lowest since the end of May on Monday. Then it rebounded slightly on Tuesday. Yesterday it came back to the level of 2,700. Is this a new downtrend or just downward correction within the medium-term consolidation? 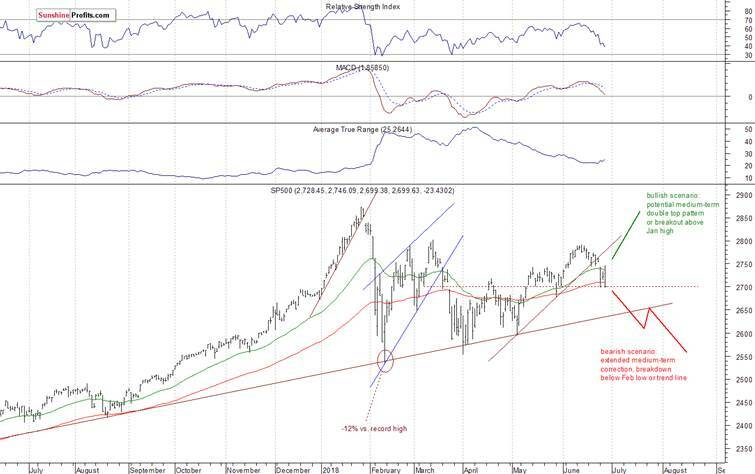 The market may extend its decline, but there is a potential level of support of around 2,700. We may see some short-term uncertainty here. There have been no confirmed positive signals so far. Concluding, the broad stock market will likely open slightly higher today. Then the S&P 500 index may continue to fluctuate along the support level of 2,700. If it breaks lower, we could see more selling pressure. For now, it looks like a downward correction within the medium-term consolidation.